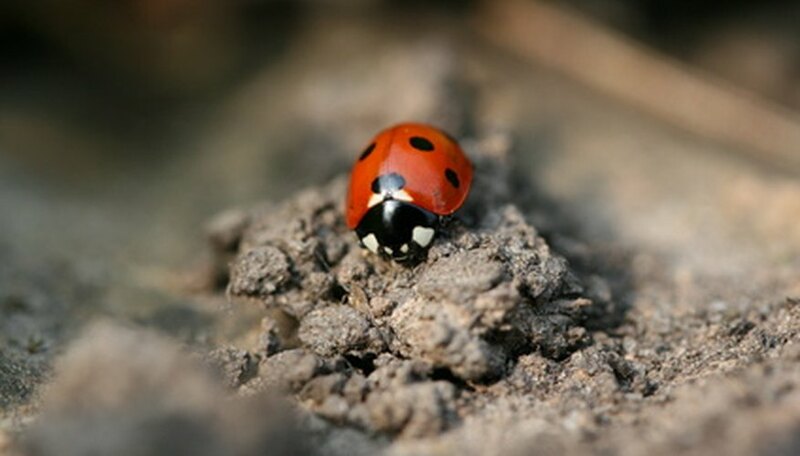 The three materials most commonly found in soil are sand, silt and clay. A soil, then, may be sandy, silty or clay soil. Silty soil is usually found in estuaries and water basins. Test your soil to determine the soil type. Identifying your soil type allows you to properly amend your soil, with the ideal soil being a roughly equal measure of all three. This is called loam. Use a shovel to dig up a portion of the soil you wish to test. If you have difficulty breaking the soil surface with the shovel and the soil is clumpy, your soil may be clay. If the shovel slides in easily and the soil doesn't hold together, it may be sandy soil. Wet down a small portion of your soil and form a ball. Hold the ball of soil in one hand and squeeze it to form a ribbon of wet soil. Hold the ribbon upright. Observe the stability of the ribbon. If it stands upright and holds its shape, you have clay soil. If it breaks and crumbles, your soil is likely to be at least 50 percent sand. Perform the jar test for a more accurate assessment. Gather together a quart-size jar, paper and pencil, table salt, a ruler and 1/2 cup of dry soil. Pour the dry dirt into the jar. Fill the jar with water, leaving approximately a third of space from the water to the top of the jar. (This space is called head space.) Add 1 tbsp. table salt and close the jar with a tight-fitting lid. Shake the jar vigorously. Wait 1 to 2 minutes for the contents to begin settling. Any sand in the soil will settle within that time, as sand has the largest particles and is the heaviest of the three elements. Measure the depth of the layer of sand at the bottom of the jar and record that measurement. Allow the jar to stand overnight without moving it. The remaining silt and clay in the soil will settle into layers. Note the different layers in the jar after the soil has settled. You should see three different layers of color and "murkiness" in the jar. The bottom layer is the sand you already measured. The next layer is silt and clay is the layer on top. Measure the depth of the silt layer and the depth of the clay layer. If the depth of the sand layer is 50 percent or more of the total depth, you have sandy soil. If the clay is 50 percent or more of the depth, you have clay soil. A 50 percent or more measurement of silt indicates you have silty soil. If you have roughly equal measures of all three, you have loam. Purchase a pH test kit from your garden center to determine the pH of your soil before adding amendments. Take samples from different areas of your landscape for a more precise assessment of your soil needs.